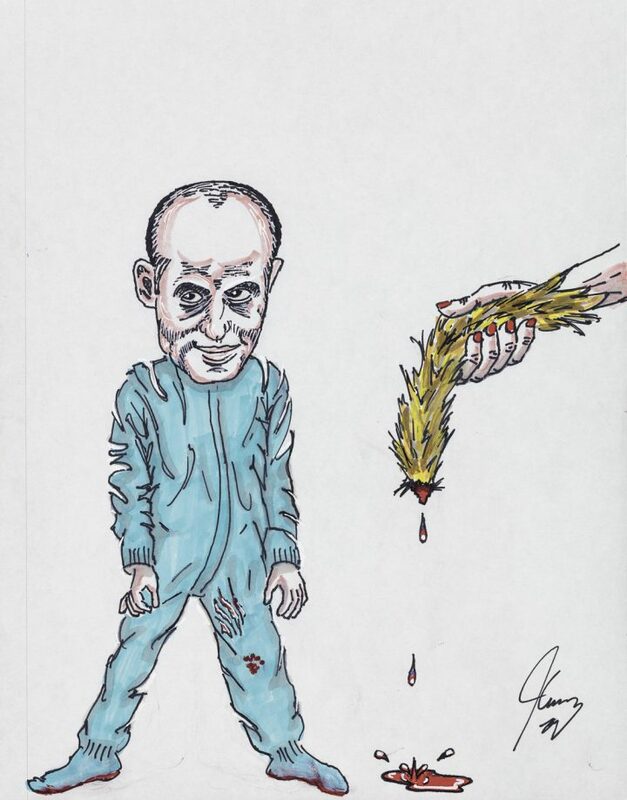 Maccarone Gallery in Los Angeles is exhibiting Carrey’s drawings, which are perfectly in line with his well-known style as a physical performer. LOS ANGELES — Jim Carrey, famous for his rubbery mugging in comedy films in the 1990s and early 2000s, has become an unlikely political provocateur in more recent years. At first, this mostly took the form of unfortunate advocacy for anti-vaccination causes, although there was also the scathing gun control video he made with Funny Or Die in 2013. 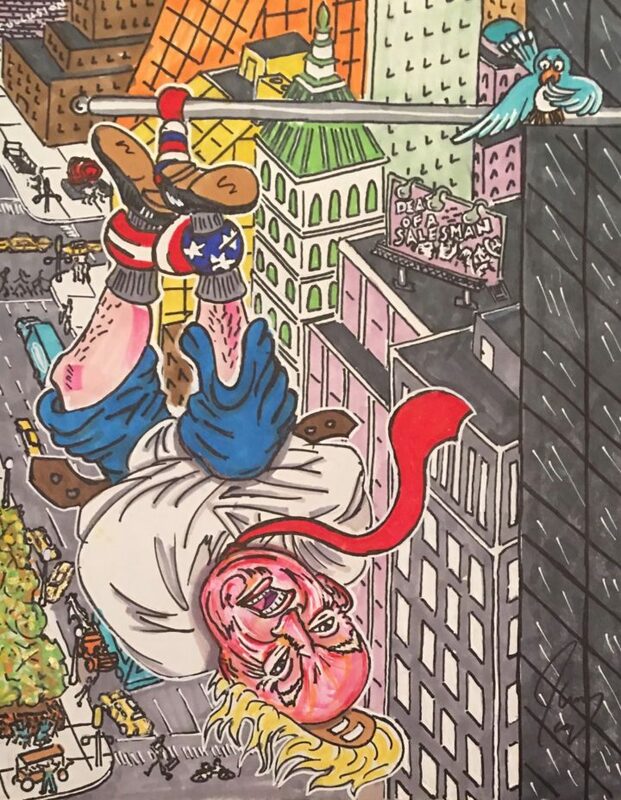 But since the 2016 presidential election, Carrey, like many celebrities, has found fresh political fervor, and he’s channeled it into a new venture as a cartoonist. He posts his drawings often enough that sometimes we can’t go more than a few days without the entertainment press noting his latest work. Now, Maccarone Gallery in Los Angeles is putting on an exhibition of Carrey’s work. 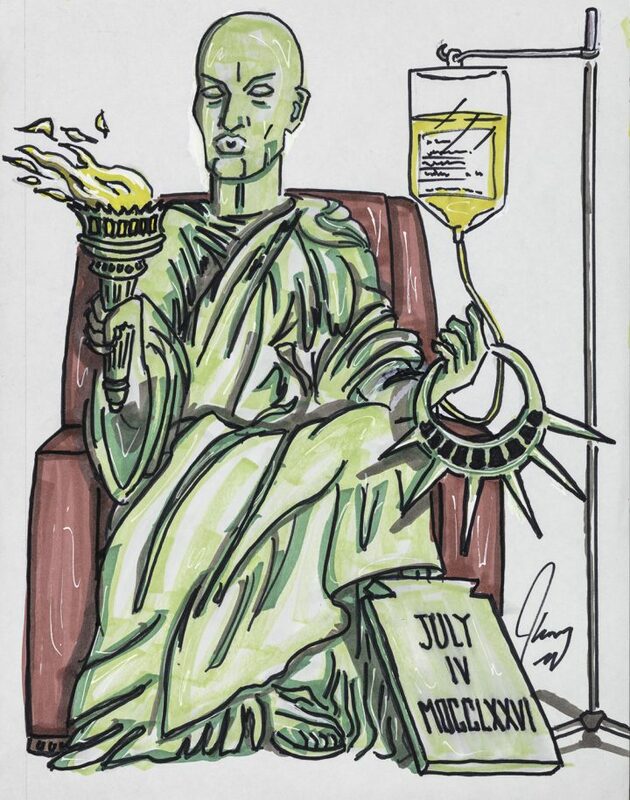 IndigNATION collects Carrey’s political cartoons from the past two years. Often drawn and put online rapidly in response to whatever new Trump administration scandal is making the news, they represent a greatest hits view of the nonstop parade of the bizarre that has been American politics since 2016. 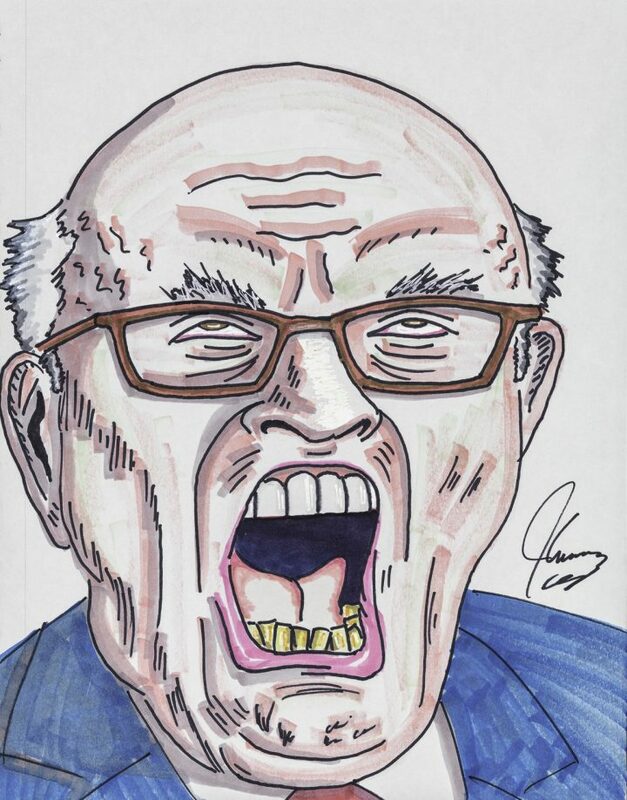 While caricature of public figures is usually a given in this genre, Carrey’s drawing style takes this to the extreme, rendering the politicians he dislikes as outright grotesque. Interestingly, the drawings also fit perfectly in line with Carrey’s well-known style as a physical performer. One could easily picture Ace Ventura or the Mask making any of these ridiculous exaggerated O-faces. There’s even a kinship between the “birth” scene in When Nature Calls and Trump’s posture below. Carrey doesn’t bother with speech bubbles or labeling everything to hammer in whatever message he’s sending. Each piece is just one blast of rage, and often contempt. He’s like a rodeo clown sticking up the middle finger. Whether Carrey’s art is actually good is a separate matter. This kind of intense commentary coming from a celebrity still mainly known for geniality is startling, if nothing else. 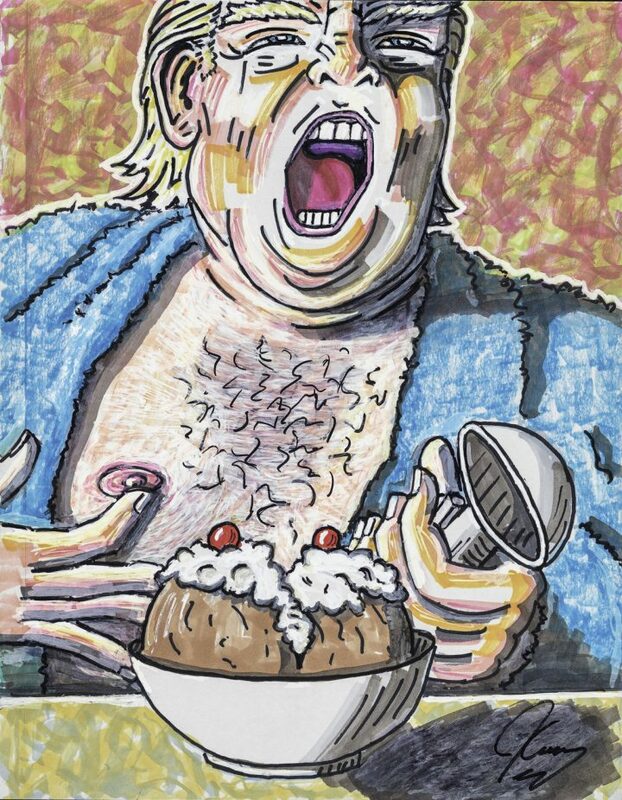 IndigNATION: Political Drawings by Jim Carrey opens at Maccarone Gallery (300 S Mission Rd, Los Angeles) on October 23 and continues through December 1.